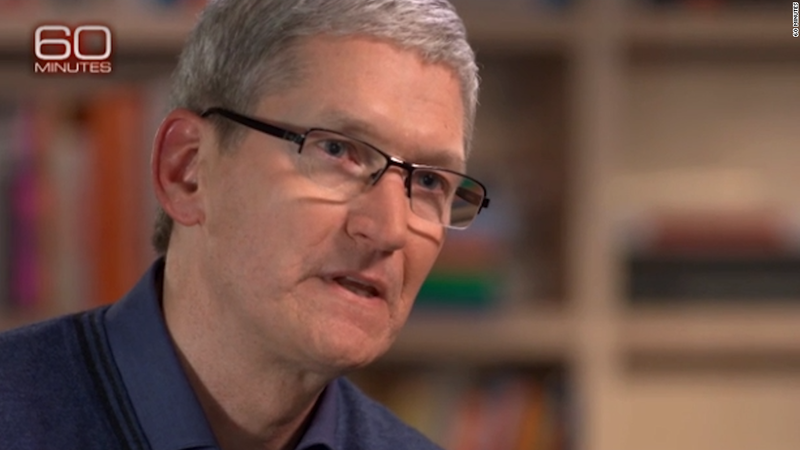 Accusations that Apple doesn't pay enough in U.S. taxes is "total political crap," CEO Tim Cook said in an interview set to air Sunday. "Apple pays every tax dollar we owe. We pay more taxes in this country than anyone," Cook told Charlie Rose of CBS' "60 Minutes." Thanks to its outsized profits -- the company booked $11.1 billion last quarter -- and the fact that two-thirds of its business is overseas, Apple has topped the list of U.S. multinationals in the crosshairs of some lawmakers. They believe multinationals like Apple aggressively try to take advantage of loopholes in the tax code to reduce their U.S. tax bill by shifting and parking profits abroad in low- or no-tax countries. Under current law, U.S. companies owe federal corporate taxes on all their profits, regardless of where in the world they were earned. But they only have to pay tax on overseas profits when they bring the money back to U.S. shores. Cook told "60 Minutes" he would "love to" repatriate Apple's foreign profits but that he can't because "it would cost me 40%." The 40% refers to the combined U.S. federal and state tax rate Apple would likely owe. Cook's mention of the 40% suggests that much of Apple's overseas money is not currently being taxed, said Martin Sullivan, chief economist of Tax Analysts. That's because any tax the company was paying to a foreign government could be taken as a credit against its U.S. tax obligation, effectively reducing that 40% rate. Cook noted in his "60 Minutes" interview that the U.S. tax code is to blame for companies being reluctant to bring their foreign profits home. It's been estimated that U.S. corporations may have more than $2 trillion in profits offshore, out of the reach of Uncle Sam. "[The tax code] was made for the industrial age, not the digital age. It's backwards. It's awful for America," Cook said. It's hard to find someone in Congress who doesn't want to reform the corporate tax code. But there are still big disagreements over how to achieve it. Some Republicans have been pushing for the United States to shift to a so-called "territorial" tax system, whereby companies would only owe U.S. taxes on profits earned in the United States. Any profits earned in another country would be taxed at that country's corporate rate. Most other countries have a territorial system. As an interim measure, some favor a repatriation "holiday" -- in which corporations may bring money back to the United States for a limited period of time in exchange for a much lower tax rate. But other lawmakers see that as a corporate giveaway. The Cook interview will air on CBS between 7:30 pm and 8:30 pm ET, 7 pm and 8 pm PT.